Opuntia ficus-indica, commonly referred to as prickly pear or Nopal cactus, belongs to the Cactaceae family which includes around 1500 species of cactus. 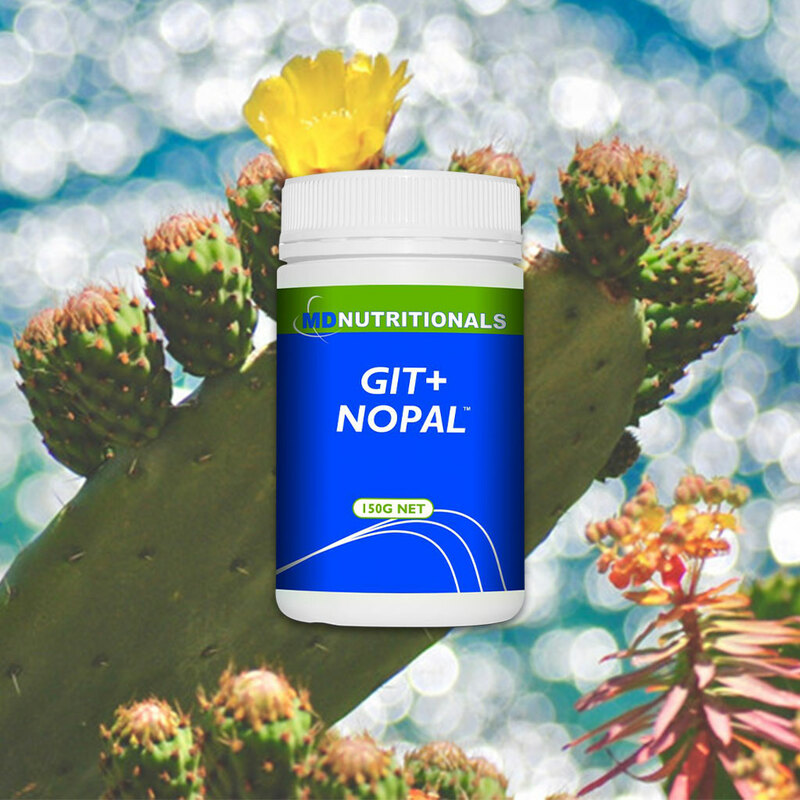 Nopal cactus is notably rich in polyphenols, vitamins, polyunsaturated fatty acids and amino acids which has been highlighted through the use of modern extraction methods. Nopal cactus stems have been traditionally used in Mexico to support health. Each serve supplies 1600mg of Nopal cactus sourced from the baby cladodes, which are the flattened leaf like stems of the plant. L-glutamine is the most abundant amino acid in the human body. It plays physiologically important roles in various metabolic processes. N-acetylglucosamine is a derivative of glucosamine with distinct biological activity. Turmeric (Curcuma longa) is a spice that has long been recognised for its health properties. Curcumin is the main natural polyphenol found in the rhizome. Aloe vera is a perennial succulent that has had applications in health and cosmetic products for many centuries. Quercetin belongs to a group of polyphenolic substances known as bioflavonoids. This natural compound is mostly found in fruits, vegetables, and certain beverages. Quercetin is a phenolic antioxidant that exhibits a wide range of biological activities. Marshmallow (Althaea officinalis) is a perennial herb that has been used in traditional herbal medicine to soothe irritated mucous membranes. Fennel (Foeniculum vulgare) is an ancient seasonal herb. Phytochemical studies have shown the presence of numerous valuable compounds, such as volatile compounds, flavonoids, phenolic compounds, fatty acids, and amino acids. Licorice (Glycyrrhiza glabra) is a herbal plant named for its unique sweet flavour. Deglycyrrhizinated Licorice is specially processed, and is free of glycyrrhizin.